I called the picturesque province of Nova Scotia my home for five years. I lived in Middleton in the Annapolis Valley while John was posted to CFB Greenwood. My favourite things about my time there were being 10 minutes from the ocean, delicious seafood at reasonable prices and the majestic scenery. Though I’m happy to be back in my home province of Ontario, I would love to go back for a visit and to finish up my travel bucket list. There’s so much left to see and do! 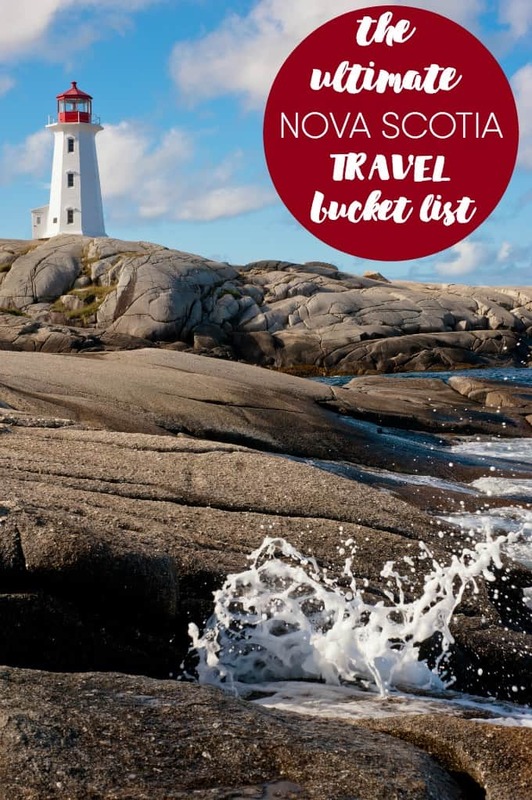 Whether you’re touring Canada or are a native to Nova Scotia, you’ll enjoy all of the stops on this Ultimate Nova Scotia Travel Bucket List. Peggy’s Cove is number one because it was my personal favourite spot! A few of the other locations are ones I still want to visit. Take a peek and start planning your dream vacation to Nova Scotia! 1. Peggy’s Cove. 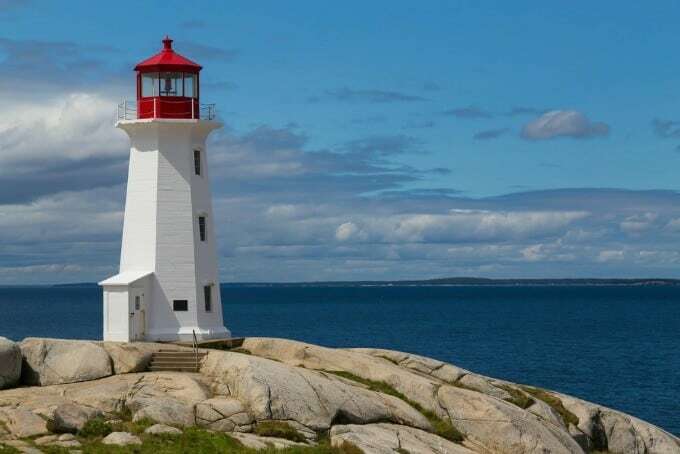 Home to over 160 lighthouses, Nova Scotia is no stranger to historic beauty. Peggy’s Point Lighthouse was built in 1915, and is still standing steadily today. You could spend the entire day here, just watching the waves and taking photos. 2. Lunenburg. Old Town Lunenburg’s unique and colourful architecture makes it a “must see” for everyone. 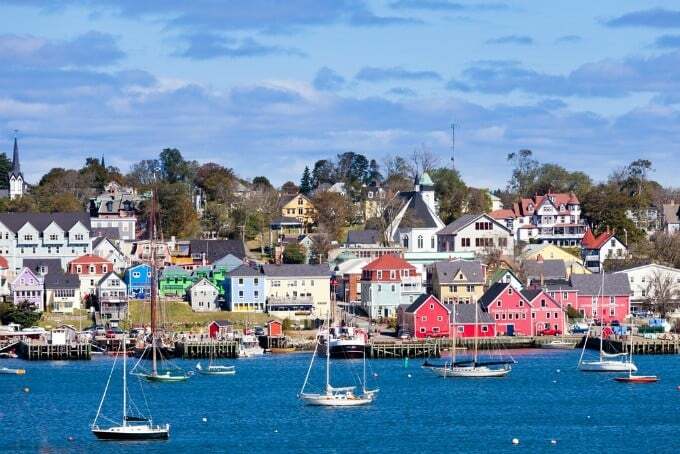 Lunenburg’s tranquil harbour offers easy access to forests, and is a popular fishing area. Visit the Fisheries Museum of the Atlantic while you’re there. 3. Titanic Museum. The Titanic Exhibit at the Maritime Museum is something the whole family can visit and learn from. 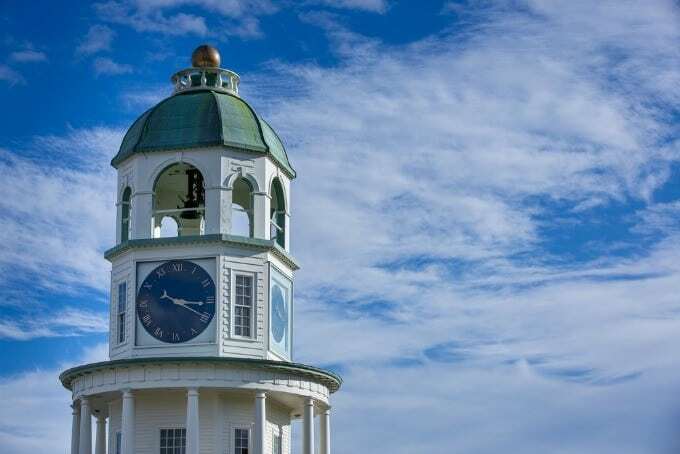 You could spend hours here, learning about the history of Halifax, and viewing photos and displays exploring the rise and fall of the Titanic. Consider visiting the Museum of Immigration while you’re in the area. It’s located at the other end of the waterfront from the Titanic Museum. 4. Cape Breton Island. 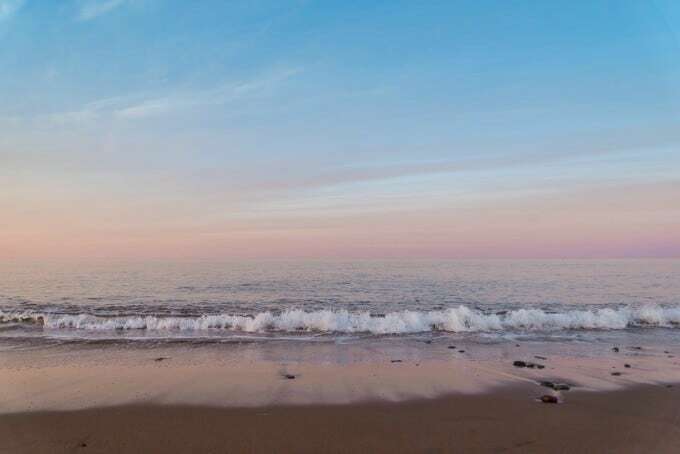 If you’re looking for a relaxing escape from the hustle and bustle of everyday life, Cape Breton is the place to go. They’ve got hiking trails, plenty of water for boating and kayaking, courses for golfing, and plenty of other things to do on this beautiful island. Be sure to visit the Alexander Graham Bell National Historic Site! 5. Citadel National Historic Site. Travellers have the opportunity to explore the history of the fortress and the soldiers who were stationed at the Citadel. Every day, the Citadel hosts re-enactments. Every hour, watch the sentry guarding the front gate be changed. During your visit, you can walk inside and outside, visit the Citadel’s Army Museum, and get to touch a piece of Halifax’s military history. The museum showcases weaponry and uniforms from its past soldiers. They say the Citadel grounds are haunted so a guided tour might be your best bet if you’re looking to be spooked! 6. Annapolis Valley. Take a step back in time to a simpler era. From its apple orchards to its beautiful farms and vineyards, Annapolis Valley is a hidden gem that’s on most Nova Scotia bucket lists for good reason. The Annapolis River is perfect for kayaking, boating, and even sailing, with easy access to the North Atlantic and the Bay of Fundy. You’ll enjoy some of the best meals here, from locally grown vegetables to fresh cod and lobster, it doesn’t get much better than that. 7. Brier Island. Another gorgeous island on our bucket list, Brier Island is a rugged diamond in Nova Scotia’s crown. This island is nestled where the Bay of Fundy and the Gulf of Maine meet and is perfect for whale watching. 8. Lawrencetown Beach. This south-facing beach stretches on for nearly 1.5 km and is known as the destination for both local and international surfers. The spectacular waves are second to none so you’ll definitely want to bring a camera to capture their beauty! Lawrencetown Beach is where you go when you need to recharge. If you go at the right time, you might not see anyone else on the sand. Check the beach weather report and tide levels before you head over. 9. Sable Island. This small island located 300 km southeast of Halifax is remote and beautiful. It’s home to a plethora of wildlife including wild horses and grey seals. Spend hours exploring the beautiful beaches, dunes and bogs and experience the untouched wonder of mother nature. 10. 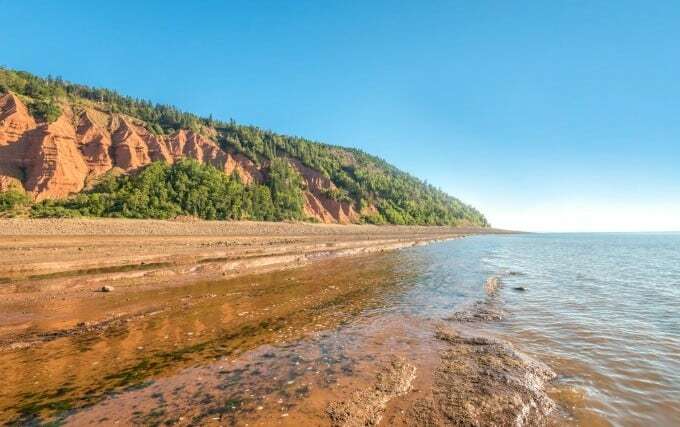 Joggins Fossil Cliffs – This UNESCO World Heritage, located on the Bay of Fundy, has 15 km of coastal cliffs. Walk along and view what life was like 300 million years ago in the “Coal Age”. What spots are on your Nova Scotia travel bucket list? Thanks for the post, I so want to make it to the East Coast sometime! I’ve never been and it looks so stunning! I’m hoping to get there soon! Would love to go there on holidays one day, it looks so beautiful. So far I have been to Newfoundland and New Brunswick. There is definitely something special about the east coast. This was a great post, I would love to go there some day, sounds and looks so beautiful!! I lived in New Glasgow and Truro in the 3 years I lived there. Great place to visit, crappy place to live if you are not from there. My family has history there so I would like to see it when we visit NS this summer. Any suggestions? I only got as far east as New Brunswick but would love to go further and yes Nova Scotia is one of the places I’d love to visit. spending time seeing all of Nova Scotia has been on my bucket list for years….someday. Had a couple 3/4 day visits in NS about 20 years ago…Time I went again…would like to go in the Fall for the colors. I have never been, but sure would love to visit someday. I have seen so many beautiful pictues. I would love to actually see it in real life. You ALL must go to Nova Scotia, New Brunswick, PEI and Cape Breton. I was there on a 15 day group trip in Sept. 2016 and it was absolutely amazing. So memorable and so absolutely amazing and beutiful. I live in PA and am seriously considering a road trip back (taking the ferry from Portland to Halifax). I’m a widow, and haven’t driven that far alone before, but that area of Canada is worth a 2nd trip for sure. I LOVED LOVED LOVED Cape Breton – well the whole trip! You have created a wonderful bucket list. 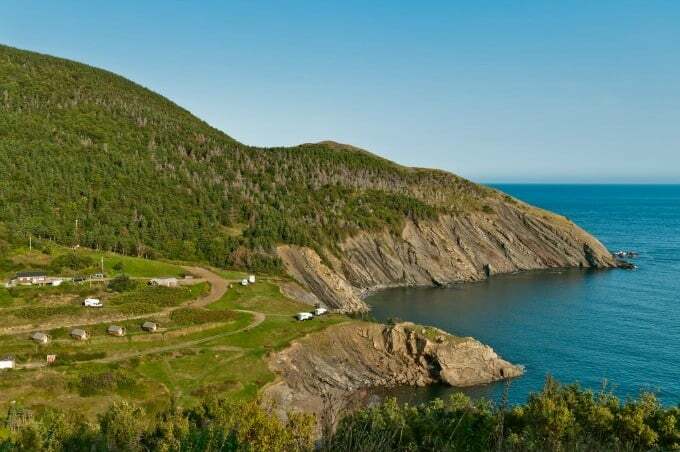 The cabot trail and fossil cliffs are my top priority for my next trip to Nova scotia. If you would like to, here’s a link to my list itinerary and favorite spots. If possible, do share your inputs on the itinerary. Considering that you had stayed in Nova Scotia for 5 years, I could only hope that you will get something new in it for you.